In the last month, I have fielded many questions regarding Federal Reserve monetary policy and financial markets. Not a surprise since so much happened in that sphere. The Fed announced a change in policy. No wait, they didn’t. In fact,all they said at some point in the future we may see the U.S. economy strong enough that massive monetary stimulus may no longer be necessary. We should really file this under a non-story type of title, akin to saying at some point the sun will rise, but I am not sure when. That is not the world we have right now, and certainly is not the mentality in the financial markets. The reason why has to do with the actions undertaken by the Fed in response to the financial crisis. The dark blue and the light green areas of the graph are what I am highlighting today. Federal Reserve treasury purchases took off and remain incredibly high. 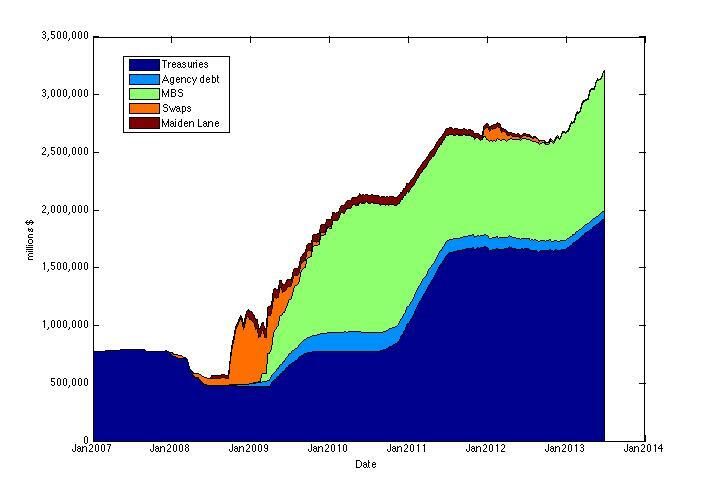 This is how the Fed manages their interest rate targets and how they kept rates so low for the last several years. Suggesting fewer purchases of bonds in the future suggests that rates can increase above their historically low level. It is a similar situation with mortgages and mortgage rates. If the Fed purchases fewer mortgage backed securities it raises the prospect of higher mortgage rates. Keep in mind all this is still only a suggestion. The Fed did not announce a timeframe for changes to policy, just that the economy continues to improve, albeit at a painfully slow rate. So why is this turmoil for financial markets? Traders face the biggest challenge from a change in policy. With rates so low, low return trades are acceptable, particularly when they can be done enough times to generate serious volume. This is all well and good when rates are between 0 and 0.25%, but if you can earn 3% on a short maturity bond, the low return equity trade does not look as good. So an announcement of some policy change arriving at some still unspecified point in the future is trouble for the trader, not for the long term investor.